Cots have the reputation of being heavy, bulky and not always all that comfortable. Not really something that you want to take into the backcountry, right? 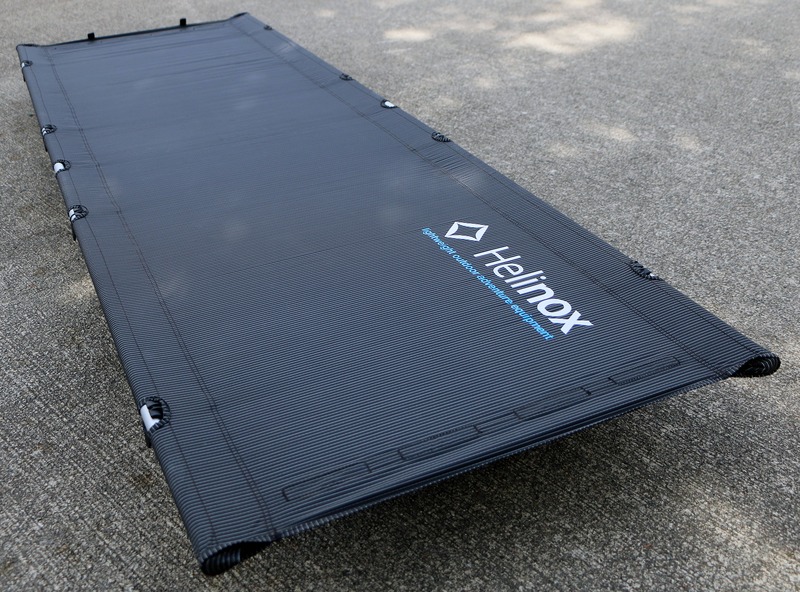 But wait, Helinox, a company that’s been creating some amazingly light and comfortable camping gear such as the Chair One, has created a matching cot, the Cot One. Lightweight, portable and comfortable, I’m going to miss having this unit around when I return it! The Cot Lite assembled and ready for business. The Cot One is amazingly comfortable for such a small and light package. When on level ground the cot has no high or low spots, just an even and firm bed surface. 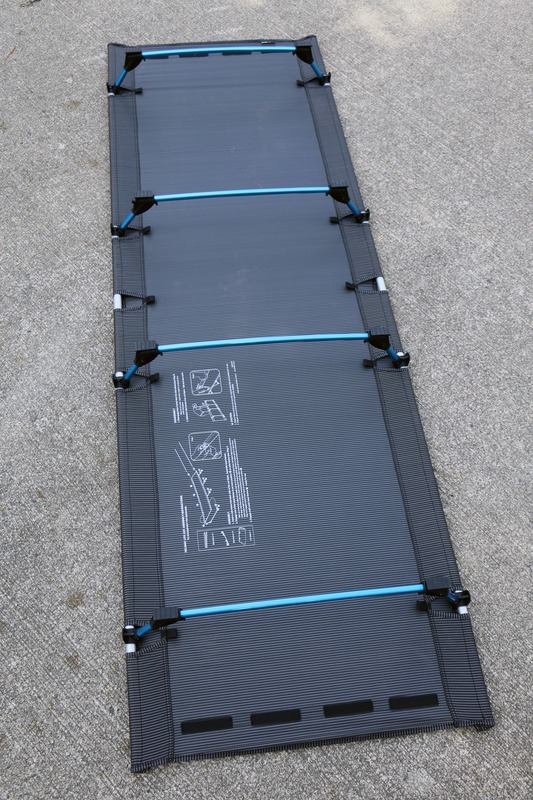 I tried it both with and without a sleeping pad and prefer the pad as I like to sleep on my side. However works just fine without a pad and is even a bit cooler which can be nice on hot nights. 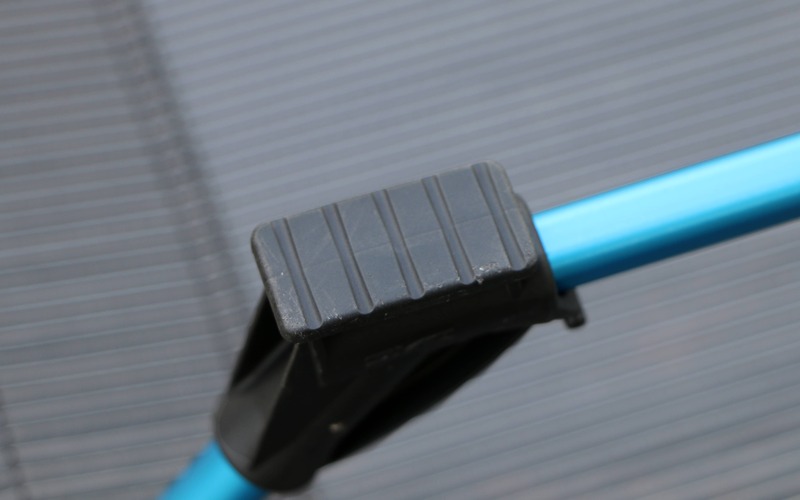 Each of the four legs has a pair of durable plastic feet. Small enough to poke through on really soft ground but generally supportive. While I wouldn’t categorize it as a super speedy set-up, it’s straight forward and relatively easy. 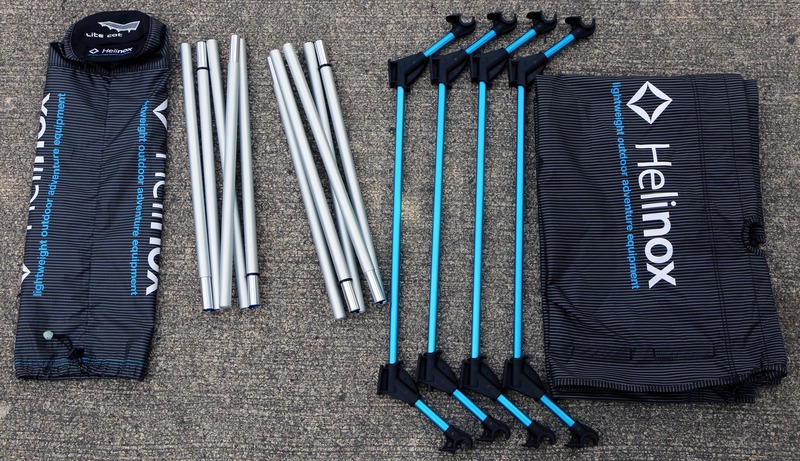 Basically the 3 legs and the 2 frame poles snap together like tent poles. The frame poles are fed into sleeves in the top sheet and then the legs are snapped into place. Once assembled the cot has 6 small points of contact with the ground making it easy to level. 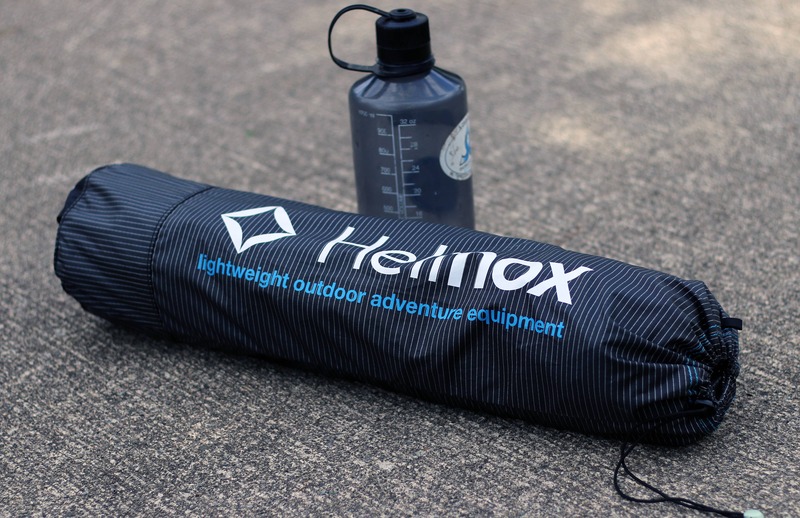 The Cot Lite wraps up into a surprisingly small and lightweight package. All the pieces and parts that make up the Cot Lite. 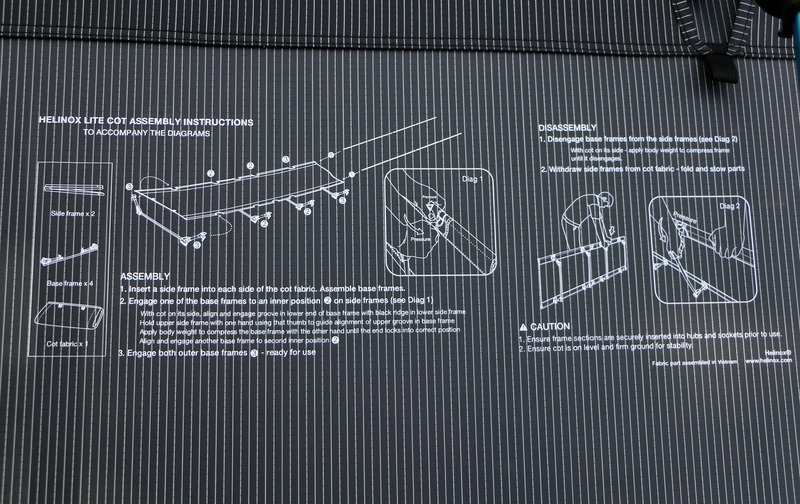 The assembly instructions are actually printed on the underside of the fabric, no chance of losing them! Assembly is fairly intuitive though. With stiff side beams and 4 legs Helinox has made the Cot Lite very supportive and comfortable. No high spots or saggy spots on this bad boy. So, where to use such an item? To start I tried it out on a multi-week trip to Indian Creek. Space in my car was at a premium but I still wanted a comfortable sleep and a level sleeping surface and the Cot One was perfect. Took it on a fly-in base camp style mountaineering trip where it rained a lot and I was glad to sleep with the knowledge that I would wake dry. Tested it out a few nights in a small roadside ski touring warming hut, it didn’t have any beds but a lot of mice and I figured that sleeping off the ground would keep them from running over my face. Even had a guest crash on it at my place in Squamish when the guest bed was taken. This portable bed is amazingly comfortable and lightweight (for a cot) and when a little luxury is an option it’s nice not to have to sleep on the ground! Overall: A versatile cot. It’s small and light enough to take with you but comfortable enough to use at home.